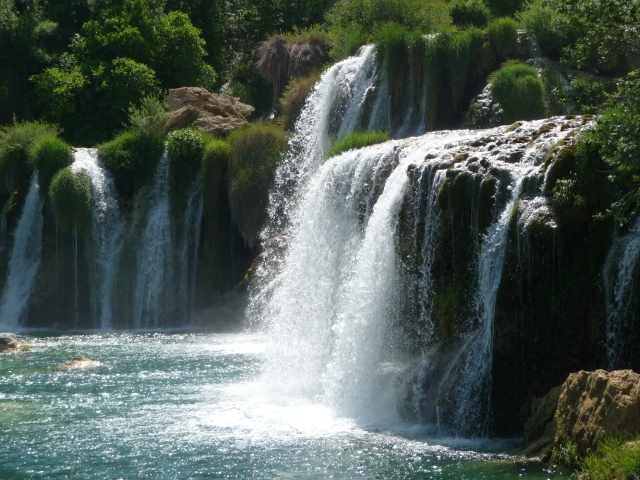 A bit further up the coast from Trogir, you come to the city of Šibenik and inland from here, the Krka National Park famed for its wondrous waterfalls. As usual now, we did a recce to check out campsites and find out more information about where to enter the National Park and the boat trips you could take when you did. We found two campsites side by side a couple of kilometres away, one of which gave an ACSI discount, with the other looking the more shady of the two. We drove onto the nearby town of Skradin for supplies and then to the entrance of the National Park where we were handed a flier for the shady campsite, evidently by the granddaughter of the family, which was matching the discount price of its neighbour. That was decided then. Next morning bright and early, we got on our bikes and headed to the National Park. At around 10 euros entrance fee each, it was the most expensive entry to a National Park we’ve paid. After locking our bikes up, we jumped aboard the bus that would take us into the heart of the park and the first series of waterfalls, Skradinski buk. Instead of queuing at a booth window, as the tourists disembarked a chap with a loudspeaker greeted us all answering the most obvious questions in one fell swoop. 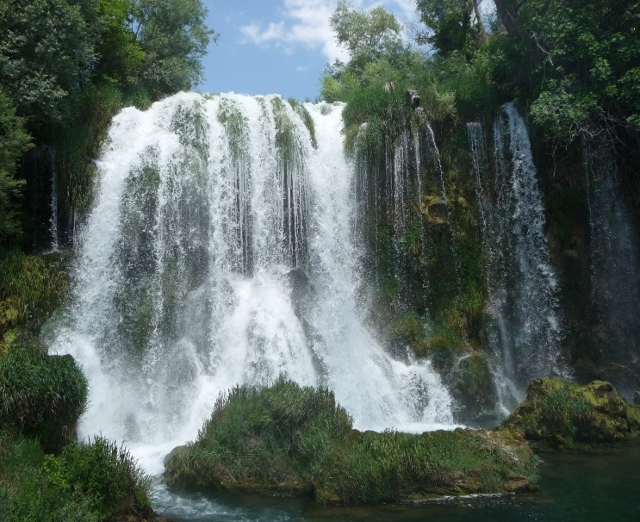 We purchased tickets for the boat trip that would take us up river to a second set of waterfalls – Roški slap – that departed at noon, and wasted no time in following the directions to the lower set. Wooden walkways led us through partially submerged woodland with bridges over pools, and streams, and torrents. 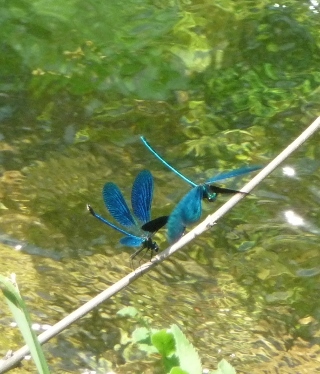 We were immediately struck by the buzzing life in the sun glinting glades. 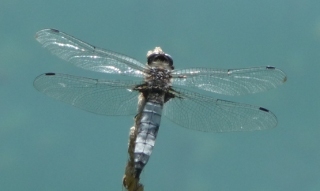 Hundreds of dragonflies, damsel flies and any number of similar flying creatures entranced us as their colourful bodies and filigree wings caught the light. Fish shimmered beneath the surface and frogs were airing their curious melodies while the songs of hundreds of unseen birds filled the air. It was magical and we strolled in wonder, before we even spied our first waterfalls. The walkways were busy with people too, but we just let them overtake us, many of them seemingly unaware of the majesty of nature around them. There are around seventeen cascades of different heights and varying widths, some gently tipping over a ledge not much higher than a doorstep, others around 20 metres high, the river pouring over travertine rocks (made of limestone sediment). The highest one dropped into a pool where swimming was allowed. Naturally it was already crowded and we put off our swim until later in the day. We had been so absorbed in our surroundings for a couple of hours and it was time to catch our boat, which left from above the falls. It was a relaxing afternoon on the boat, three hours or so up the river and back, but we had limited time at the two stops. The first was Visovac, a Franciscan monastery on an island. We had a whistle stop guided tour of the small, but fascinating museum and the church before being whisked back to the boat, with a couple of minutes to spare to buy a cold drink. 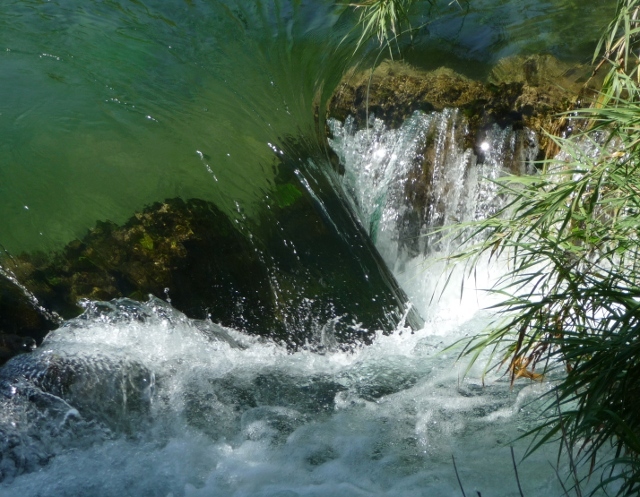 The boat then made its way to Roški slap, the second series of falls, pulling right up close to the spray. 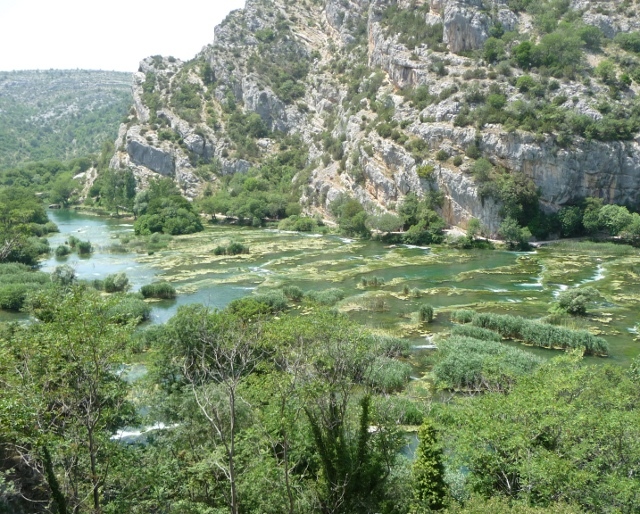 Roški slap was set between the steep sides of a gorge, and was less wooded and more open than its lower partner. We only had an hour here, but managed to have a brisk walk around the sequence of cascades and a climb half way up the side of one of the gorge cliffs. If we had more time, we could have followed the stairs up and up to the top for an even more spectacular view. We made it back to the watermills at the base, which doubled as bars for that all important cold beer before the boat left again. Back at Skradinski buk, we wandered back to the swimming area. It has got hotter and hotter here during the last few days, touching the mid 30s celsius, and we were looking forward to our waterfalls swim. On the way down, we stopped into some demonstration water mills with mill stones grinding corn, and I managed to drag Adrian away from the rakija tasting stalls along the path eventually. It was still busy by the ‘pool’ but we managed to find a spot among the tree roots to leave our stuff, and it was a relief to get into the water. The main falls were cordoned off, probably wise as some young guys were diving from the top … you could go to one side though to find your own exhilarating waterfalls massage experience. Clambouring over rocks, we sat beneath torrents leaving us breathless but joyous. Swimming in caves just a few days before off Vis and Biševo, now we were swimming, climbing and jumping in waterfalls. We managed to drag ourselves away eventually and it was uphill to the bus stop again, to take us up to the entrance and our bikes. It was expensive, but worth every penny. If it had been cheaper we would have been back for more swimming here another day. The campsite was simple but like all the other campsites we’ve been to in Croatia so far, it was spotlessly clean with full provision of toilet seats, paper, soap and paper towels plus hot water. They also had a restaurant and we gave into temptation to try the grilled meat dishes after our long day in the park. It was a transient camp, most campers only spending one or two nights here. We decided to stay a third night and use it as a base for exploring Šibenik itself, as well as getting some retail therapy out of the way at the shopping centre south of the town. Šibenik has a good-sized medieval old town with a splendid cathedral, which boasts one of the most exquisite baptistries we’ve seen on our travels with daylight touching its carved ceiling through a gap. It was about to host its annual children’s festival and stages were being set up around town where performances were to take place. 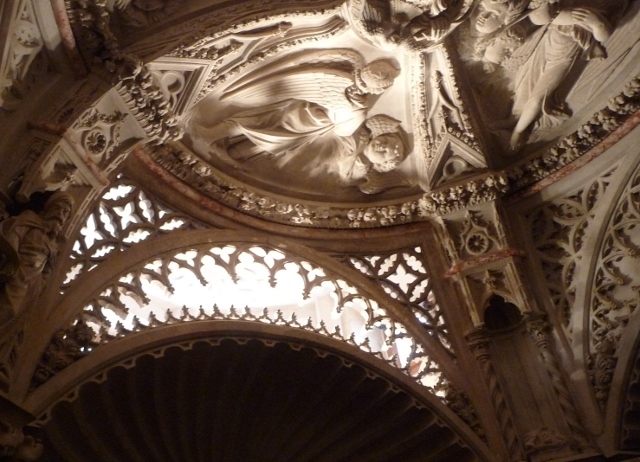 Climbing up the rows of seating enabled us to get a better look at the carvings on the cathedral’s facade, many of them in similar style to the church at Trogir, particularly the Adam and Eve figures. After an hour or so of wandering the narrow byways, we followed the sign up some steps to the Medieval Garden and were rewarded by a wander round a small but charming formal garden in what was a former monastery. As welcoming was the icecream served in the café there, complete with resident cat who flaked out beneath my chair. Our last night at the Krka campsite brought welcome fellow VW T25 campers from Germany – Flo and Vera. Although we were all too tired to socialise we had a good chat and will hopefully catch up with them in the future. We had a slow start next morning and continued our drive up the coast towards the island of Murter.